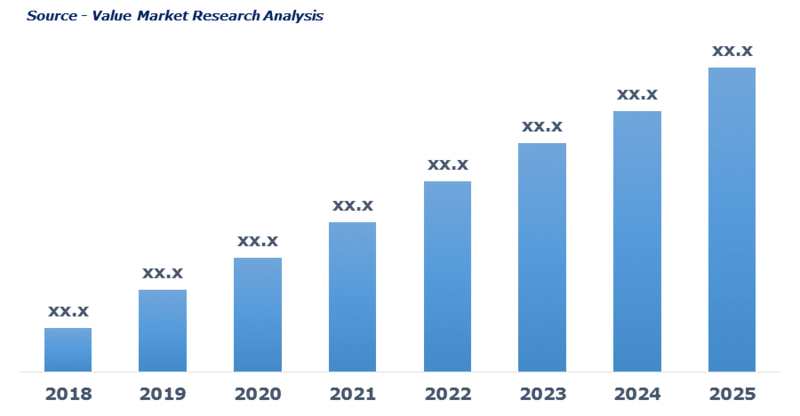 As per this study the Global Road Marking Materials Market was valued USD 6.8 BN (by revenue) in 2018 and is anticipated to reach USD 9.8 BN by 2025 with a CAGR of 5.3%. Road marking materials are basically used for creating road markers on roadways and pathways in order to guide pedestrians and drivers. It is also used to make signs on motorways, streets, berms, parking areas, and airfields. Therefore, markings and standardized are very important as they avoid confusions and increases road safety. The increasing government safety regulation on roadways safety is driving the overall market growth. Rapid urbanization along with the technological advancements such as skid resistant technology is also fueling the demand for road marking materials in the market. On the downside, road marking materials have a high life expectancy of road marking material is the only major factor that can restrain the market growth. Whereas, the increasing applications of marking materials in airport marking sector is projected to offer a huge opportunity to the market. This detailed market study is centered on the data obtained from multiple sources and is analyzed using numerous tools including porter’s five forces analysis, market attractiveness analysis and value chain analysis. These tools are employed to gain insights of the potential value of the market facilitating the business strategists with the latest growth opportunities. Additionally, these tools also provide a detailed analysis of each application/product segment in the global market of road marking materials. The broad road marking materials market has been sub-grouped into type and application. The report studies these subsets with respect to the geographical segmentation. The strategists can gain a detailed insight and devise appropriate strategies to target specific market. This detail will lead to a focused approach leading to identification of better opportunities. Furthermore, the report comprises of the geographical segmentation which mainly focuses on current and forecast demand for road marking materials in North America, Europe, Asia Pacific, Latin America, and Middle East & Africa. The report further focuses on demand for individual application segments in all the regions. The report also covers detailed competitive landscape including company profiles of key players operating in the global market. The key players in the road marking materials market include Automack Technologies, Aximum SA, Ennis Flint, Evonik Industries, Geveko Marking, Kelly Bros Erinline, Ozark Materials LLC, Roadmarking Industry Association of Australia, Sherwin Williams Company, and Swarco Limburger Lackfabric GmbH. An in-depth view of the competitive outlook includes future capacities, key mergers & acquisitions, financial overview, partnerships, collaborations, new product launches, new product developments and other developments with information in terms of H.Q.